Last week I stopped in my local quilt shop and saw this on the counter. 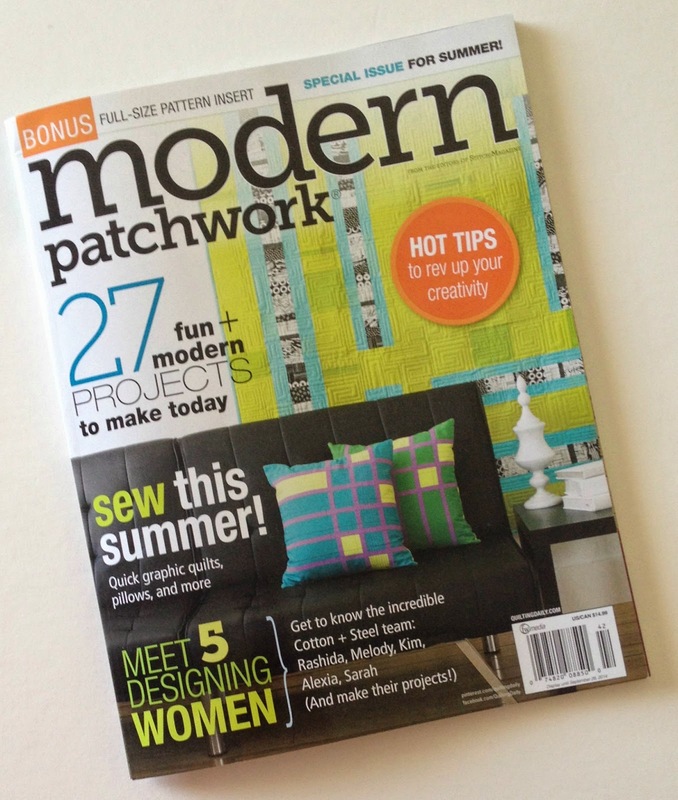 It's the newest issue of Modern Patchwork. Here are some closer shots. Taken in my backyard. I'm so happy with this quilt. I used a lovely set of fat eighths from Cherrywood. This was not my original plan for setting the blocks. But thanks to a lovely weekend with Elizabeth, we played around with the blocks on her living room floor and she helped me come up with this setting. Quilting friends are the BEST! On the subject of quilting friends, Anne Diester's pillows are on the cover! This is Anne's second time as a cover girl. She is crazy talented so I hope you will check out her blog if you haven't been there before. Anne and I are going to be roomies at QuiltCon, and the thought of meeting her in person and spending a weekend together makes me so happy. I'm linking up with Crazy Mom Quilts and TGIFF. Have a great weekend! Congratulations to you! Your quilt looks awesome! I definitely need to find this issue. Congratulations! looks great from here -- have to look for it! Congratulations - your quilt looks lovely. I still love that blue door beside it. Talk about talent - that would be you Cindy! Great design. Anne and Elizabeth are very talented also! Congratulations! Your quilt is teuly beautiful! Such a fun setting. Thank you for sharing at TGIFF. Wowza! Cindy! Congratulations! Well, won't that be fun for the two of you at Quilt Con....I can't wait to hear what you think. I would love to attend. So excited for you...congratulations! This is such a beautiful quilt. COngrats!!! 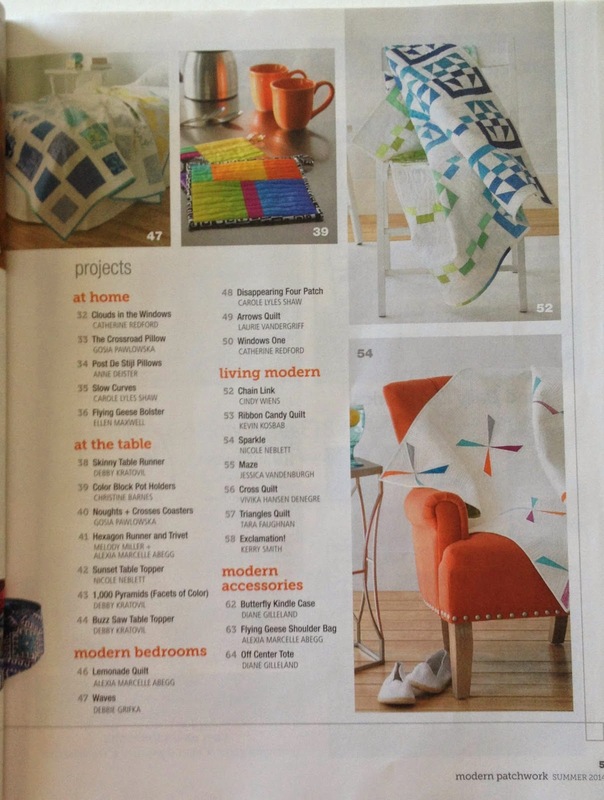 Oh very awesome that must be to walk in a store and see your beautiful quilt in a magazine! Cool! Congratulations Cindy on such a beautiful quilt and for having that quilt featured!!! Can't wait to see both you and Anne at QuiltCon. I absolutely love the innovative setting for these blocks! Congrats, Cindy! 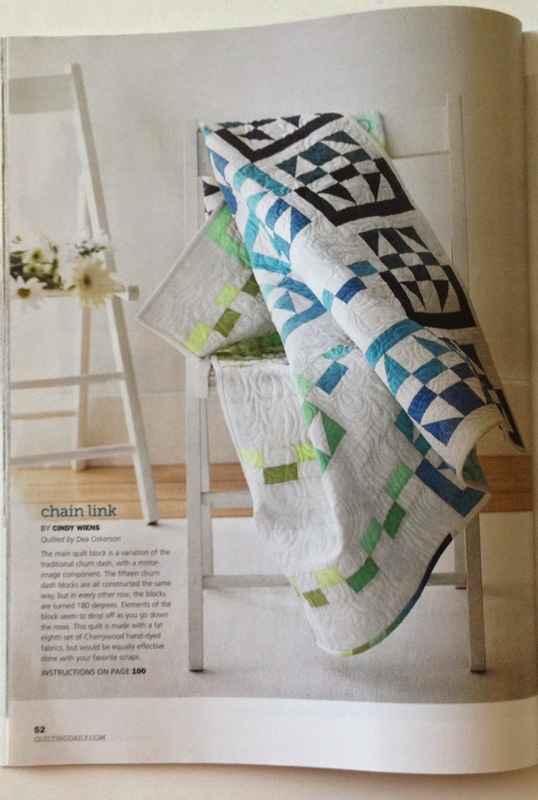 Congratulations on the article and such a great quilt! I really like it a lot! WaHoo!!! Love your design Cindy. I can't wait to meet you in person too. QuiltCon will be so fun mostly because of the chance to meet blog people in person. Thanks for the nice words as well. Congratulations! It's a beautiful quilt! Love your cottage sign too! Whoo hoo! You are famous. Congratulations. I'm sure you are flying high on the clouds now. Congratulations! This quilt is so beautiful and unusual that it deserved to be published! Your backyard looks charming! I just want you to know I am jumping up and down on my SIL's bed as whoop and holler in excitement for your publication of that fabulous quilt (the photos don't do it justice). Okay, maybe I'm not jumping up and down in reality, but I am inside--way to go!! I'm happy to help any time with your amazing ideas and quilt projects, and even happier to see the world get to see them. Congratulations!! Woot woot!! Look at you, starting to be one of those really famous quilty, published regularly, people...!